Environmental Protection Agency administrator Scott Pruitt has met during the last year with more than three dozen organizations that donated to his past campaigns and political committees, according to a MapLight analysis. The donors include major oil and gas companies, electricity providers, coal producers, and conservative think tanks. At least 14 of the meetings were with organizations from Oklahoma, where Pruitt served as attorney general from 2011-16. Pruitt has been mired in controversy in recent weeks, in the wake of news reports that he lived in a lobbyist couple’s Capitol Hill townhouse for $50 per night. The New York Times reported that Pruitt retaliated against five EPA officials who questioned his spending habits. The agency has spent millions on Pruitt’s 20-member, around-the-clock security team, according to the Associated Press. The agency has also faced criticism for stalling on routine tasks, such as releasing copies of Pruitt’s schedules. MapLight reviewed detailed calendar records obtained by the Environmental Integrity Project, as well as the less-detailed daily schedules published by the EPA. The records show that since March 2017, Pruitt has met with at least 39 organizations that donated $286,000 to his Oklahoma campaigns or affiliated political committees. The EPA did not respond to a request for comment. MapLight previously reported that Pruitt’s campaigns and political committees received $181,000 in contributions from donors who lobbied the EPA last year. The calendar records show Pruitt has frequently met with Oklahoma companies. In March 2017, he met with executives at Oklahoma Gas & Electric (OGE). Williams & Jensen, the lobbying firm whose chairman rented the townhouse to Pruitt, has lobbied for OGE in the nation’s capital. But the company has its own ties to Pruitt: OGE and its employees donated $36,610 to his state campaigns. Pruitt met with the company again last month. Pruitt’s state campaigns received $8,750 from the Oklahoma Independent Petroleum Association and its employees. Magellan Midstream Partners and its employees donated $2,750 to his state campaigns and to a federal committee tied to Pruitt, the Oklahoma Strong Leadership PAC. He met with both organizations early in his EPA tenure. In May 2017, Pruitt gave a speech to the Greater Oklahoma City Chamber, which donated $2,500 to his 2010 attorney general campaign. A handful of Oklahoma donors to Pruitt were in attendance, including executives from Love's Travel Stops and Country Stores ($10,500), a chain of truck stop and convenience stores; insurer American Fidelity Assurance Company ($27,750); the Choctaw Nation tribe of Oklahoma ($5,000); and the Riggs Abney law firm ($10,975). The next month, Pruitt met with the board of the American Fuel & Petrochemical Manufacturers, a trade organization whose former vice president donated $1,750 to Pruitt’s attorney general campaign and leadership PAC. Executives at Chevron, Phillips 66 and Valero were in attendance. The oil companies gave $8,500 to Pruitt’s campaigns for attorney general. 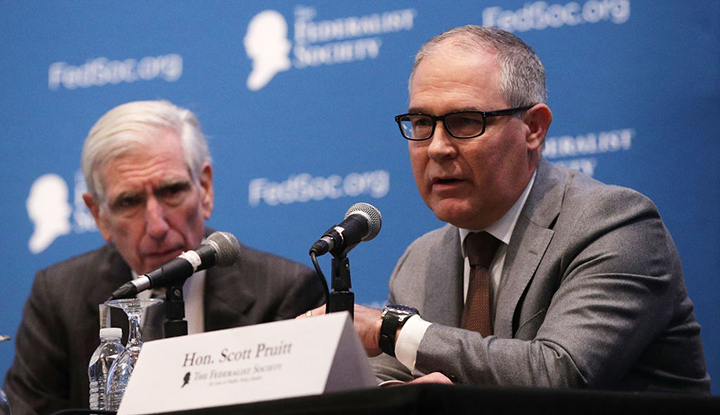 Since becoming EPA chief, Pruitt has given speeches at four receptions sponsored by the Federalist Society, the influential conservative lawyers organization. Executives at the Federalist Society donated $6,000 to his 2014 attorney general re-election campaign and leadership PAC. One executive was previously a director for a dark money organization that gave $145,000 in 2014 to the Rule of Law Defense Fund, a policy group for Republican attorneys general that Pruitt helped lead. The calendar records also show meetings with coal industry donors. In March 2017, Pruitt met with the CEO of Murray Energy, which donated $50,000 in 2016 to Liberty 2.0, a super PAC created by Pruitt allies. The following month, Pruitt had dinner with executives at the coal company Alliance Resource Partners. The company and its CEO donated $33,500 to his attorney general campaigns and his leadership PAC. At the end of March, as the news of Pruitt’s rental first went public, the EPA chief toured a Wyoming coal mine owned by Arch Coal. The company donated $2,500 to his 2014 attorney general campaign. MapLight reviewed calendar disclosures obtained by the Environmental Integrity Project, schedules published by the Environmental Protection Agency, Oklahoma campaign contributions data compiled by the National Institute on Money in State Politics, and campaign finance records for two federal political committees connected to Pruitt from the Federal Election Commission -- Oklahoma Strong Leadership PAC and Liberty 2.0, a super PAC. Campaign contributions data retrieved on March 8 and March 13, 2018.